I'm not sure if they play it up, but if they do, it's going to backfire severely the next time one of them is in a serious relationship. They're putting a target on any future romantic partner's back. It’s already happening. Scott recently deactivated the comments section of his Instagram and turned off his tags because of the hate he and his apparent new beau are receiving. Though this situation is really quite odd to say the least. She’s his former ice dance partner; the one partner he ever had before teaming up with Tessa lol. Not only that she lives in Florida. Not only that she’s separated, but just filed for divorce. I mean WTF you couldn’t have written a better soap opera if you tried. With that said fans need to get a grip and not attack them or any supposed SOs on social media. I don't think they play it up. When you are partner with someone for twenty years, there is intimacy no doubt. Outsiders saw this natural intimacy and are easily confused with romantic feelings. To me, whoever they chose to be with, it's their own business. As long as they're happy, I'm fine with it. IIRC people got mad that Meryl and Max weren't a couple either. Some people are into things for the fantasy. I am sure somewhere online there must be a group that is pissed off that Rachel McAdams and Ryan Gosling are not a couple and have a voodoo doll of Eva Mendes at hand. If Scott is dating someone there is probably a reason why he hasn't made it public at this point. I think for her sake it's probably best not to post her name and just let them be. Frankly I do not see how they could not be aware that the ambiguity in their relationship sells. If their agent/manager has not told them, he should be fired. Of course they are using this at their advantage and keeping people guessing. Why shouldn't they ? It gives them huge media attention and they need it. Starting a post-competitive career is not easy, and it probably helps with sponsor money as well. To me, they are not lying to the public, they are just playing along with it, which is fair game. And it probably attracts more fans to figure skating in general so it's quite beneficial for everyone. But yeah they'll need a new strategy if they decide to date someone else publicly. In the meantime it makes people happy to picture them together, and as long as fans do not go too crazy I do not see why V/M should not enjoy it as well. I mean it's flattering that people are invested in their partnership. Why should they break the dream ? I mean I’m not sure what people’s definition of publicly means. She was his date to their walk of fame event as well as the special Olympics event they had that weekend. 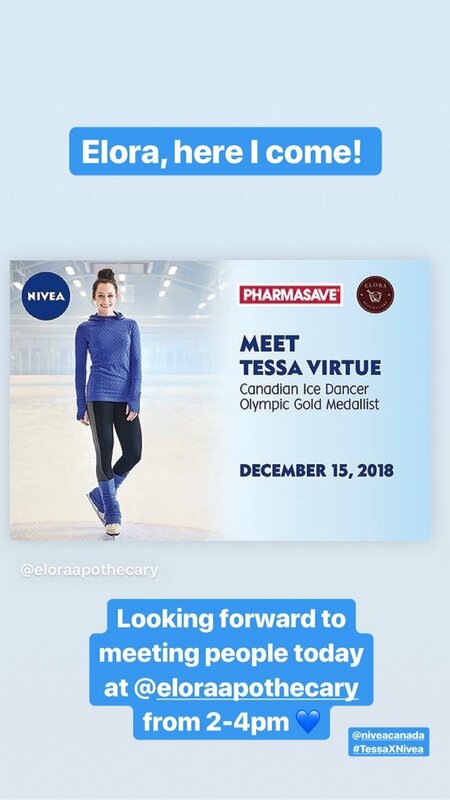 She was also at Scott cares in Nashville and some stops for the TTYCT. At the very least I don’t think he’s actively trying to hide it. In fact I might argue he’s trying to dissuade people from assuming there’s something going on with him and Tessa. But he probably wasn’t expecting people to start wishing him a life of misery either. Yeah I’m not talking about their chemistry when they’re on the ice. I’m talking about off the ice. Even that HelloFresh commercial, there was no reason to flirt their way through that video. Or when they did a bridal photoshoot. Or the hyperbolic things they say some times: “she doesn’t realize she keeps me alive”, “I might not have the strength to do it for myself but will always do it for Tess”, “I wanted to come back to skating so I could be close to Tessa again.” There’s so many more examples, but my point is they can’t do stuff like that and then act surprised that people are interested in their relationship or feign ignorance that fans would have this reaction. IMO of course. I don’t think they have a lot of chemistry off-ice? That Hello Fresh commercial looked awkward, tbh. As did the bridal shoot, which I always figured was the magazine’s idea & VM agreed bc it was easy money. It’s not like they had a lot of money in those days. Plus didn’t they say in a recent interview that their agent had left them? Maybe they were just saying yes to things that were falling into their lap. As for those quotes, while I’m sure he knows they make good sound bites, they aren’t actually romantic? You could say those things about a good friend as well. And that “keeps me alive” quote— I don’t think he actually said that. I think the fandom misheard it and it’s since been passed around as truth. But maybe someone can link me to it? ETA: Does anyone here actually soak basil in hot water and then towel dry it before adding it to a simple pasta dish? Watching her do that made me not want to buy Hello Fresh. It just seemed like a criminal waste of good basil. Except for that “keeps me alive” quote— I don’t think he actually said that. I think the fandom misheard it and it’s since been passed around as truth. But maybe someone can link me to it? He said it in their show. I know it comes from the show, but I don’t think that’s what he actually said. I could be wrong though. That’s why I’m looking for the clip. I have to say all this relationship talk is pointless. I'm just glad V/M are still working together to create new shows. That's beyond my wish to be honest. I thought they're going to drift apart or do other stuff on their own. Instead they are bringing back the ice show market and giving back to the fans. I'm grateful for that. On that note, are they doing something for Christmas this year? That Hello Fresh commercial looked awkward, tbh. I agree. They're both such terrible actors, especially Scott, that they give me major second-hand embarrassment. But at the same time it was cute and they both looked great. When not in scripted situations, I definitely think VM have off-ice chemistry - as do H/D. It doesn't mean they're together but you can't blame fans for believing that they are. ETA: Does anyone here actually soak basil in hot water and then towel dry it before adding it to a simple pasta dish? Watching her do that made me not want to buy Hello Fresh. It just seemed like a criminal waste of good basil. It's a whole lot of money, IMO. I get that it's a time-saver, but I'd really rather just go out for dinner if I were pressed for time. It wouldn't cost that much more than Hello Fresh. They're both such terrible actors, especially Scott, that they give me major second-hand embarrassment. I disagree. I thought he was excellent in that Mr. D skit, and in that Acura commercial they did last year. I thought it might be a great way to learn to cook, because having everything laid out with pictures makes it easy....but not if they’re instructing people to soak & towel dry basil. Yes, but sometimes it does. The discussion about P and C’s lifts not being dynamic or challenging as other teams despite them doing “enough “ to gain the levels has been going on for a while and not just by posters on skating forums. P and C’s lifts are beautiful and well done but they are growing repetitive except for some new lifts this season. And what they gain in being flowing etc they lose IMO in lacking dynamics and power. They are working on upping the difficulty on their lifts and also I see more drama in their program this year. They need to be very carefull (which it looks like they are doing)to not interrupt Gabby's magical captivation of both Guillaume, the judges and the crowd and viewers. This program will be a masterpiece. I’d yoy say so. For me it’s their weakest program so far. I appreciate that they are trying new lifts. Other then the music being more modern, I don’t see that much difference in this program in tone or style. There’s of course variation, but I’m still waiting to completely fall in love with this team. They’re beautiful for sure and incredible skaters, especially Guillaume, but I find myself appreciating them more then anything else. Just sliding back for a few minutes to Tessa and Scott's relationship and why it both intrigues and frustrates some people. I think - it is because it is so very intense. I think we are somewhat programmed to believe when we see that intensity that it is associated with male/female/romantic/sexual. That they are ice dancers and do act out those feelings further confuses it. As a society, we are starting to understand that other relationships can be equally intense - and not fit into that established pattern. I guess I think of Eric Lamaze, show jumper, who had such a deep relationship with his horse Hickstead that I doubt he has ever or will ever have a relationship as deep and intense with another human being and Hickstead's death was devastating to Eric. I just watched an interview with Jayne Torvill who said she speaks to Christopher every day or two. After how many years? It obviously takes a mature and understanding partner/spouse to not feel jealous or second best. I can't say what creates that kind of intensity but it seems to happen when natural soul-mates share really significant experiences. "Tessa Virtue" was the top searched Canadian in Google. And "Are Tessa Virtue and Scott Moir dating?" was apparently a popular search. Just sliding back for a few minutes to Tessa and Scott's relationship and why it both intrigues and frustrates some people. People can be intrigued and frustrated all they want. But when they start judging people they know little to nothing about (& even if they think otherwise, most fans really don’t know either Tessa or Scott) that’s when I start losing respect. The way this fandom has been behaving on Twitter and other social media channels these past few weeks has been an absolute disgrace. The skating world is small. When you post things publicly, things get back to the people you’re talking about. I’m surprised neither of them have shut down their social media TBH (well I guess Scott kinda/sorta did). I guess that's true, but I already know how to cook. I guess that's true as well. My resistance to the whole idea is largely because I don't rely on recipes for the most part for savory/dinner dishes. I don't measure ingredients (not speaking about baking here, which is different). If I could order the ingredients for my mother's incomparable coffee cake, I just might do it. I've never tried sumac, actually. Also, I tend to sometimes use non-generic spices/flavoring for dishes, like truffle oil for risotto. Basically I like some creative license with recipes. For example, I will give to smoked paprika. It is a remarkably versatile spice that can used in a lot of different recipes. If you don’t know how to cook, or are always cooking the same things, a meal kit can be a good thing. Why should they? It’s not their problem. Who cares what they are sponsoring? Unless the thing being sponsored is offensive, then take the money. I didn’t say they should? It was a tongue-in-cheek comment that I’m surprised the craziness that exploded didn’t have them running from social media. But I’m sensitive so I know I wouldn’t be able to deal with that kind of thing. I was just browsing around and watched their Original Dance to Farrucus at the 2010 Olympics. Man, are Tessa's hands divine. She uses them so much to the Spanish music and I have never really noticed them as much before but WOW! I saw this news on the screen in a train station with the sound off and the subtitles on. They replayed the beginning of their FD. Today is the ten-month anniversary of their Olympic gold. Even so, their program is so fresh in my mind, I could hear the music in my head as they were doing the moves, and even the excited “-XANNE!” Alain Goldberg yells at the end of their twizzles and the chuckle he makes once he realizes how enthusiastic he was. Yeah I’ve watched the FD a lot. It’s so inspiring. 2018 was the gift that kept on giving. Too bad they were all paid North Koreans...3,000 of them.